Today in hockey history, the NHL makes some rules changes, a goalie records two shutouts and helps his team start a streak, an interesting location for a home game, a famous brother makes his debut, and a little disagreement comes to and end. November 30, 1918 – The NHL modified its penalty rules: teams would now be shorthanded for only the first three minutes of a five-minute major, and only for the first five minutes of a 20-minute match penalty. I think we can all agree that if you commit a major penalty, you (or a player of greater or equal value) sit in the box for five. And I’m not really sure what was going on with the 20-minute match penalties or how long power plays were before it was changed to just five. 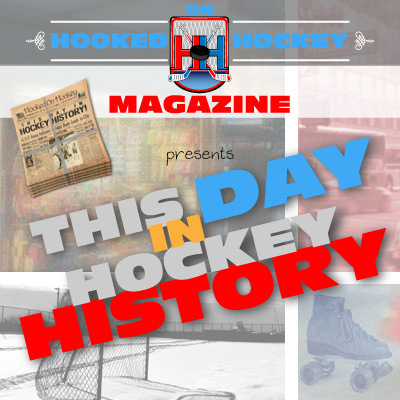 November 30, 1946 – Turk Broda and the Maple Leafs shutout the Black Hawks 11-0. That’s downright embarrassing. Exactly one year later, Broda and the Leafs picked up another shutout, but not the win this time – they tied the Bruins 0-0. Also, the tie marked the start of a team-record nine-game unbeaten streak…although they went 4-0-5 in that span, so it’s a little less impressive than nine straight wins. November 30, 1954 – The Black Hawks tied the Canadiens 3-3 in what was considered a “home” game for the Chicago – the game was played in Omaha, Nebraska, in front of 4,506. Well, you don’t go to Nebraska to see hockey. They actually played six “home games” on the road that year, in Omaha, St. Louis, and St. Paul. November 30, 1979 – Duane Sutter became the second brother to play in the NHL (remember, eventually five Sutter brothers would play an NHL game), and he scored twice in his debut, a 5-3 Islanders loss at Edmonton. Interestingly, he replaced Billy Harris, who was scratched after playing all 576 games in Islanders history. November 30, 1993 – The National Hockey League Officials’ Association (NHLOA) announced the end of their strike, which had begun 15 days earlier. Officials in other hockey leagues supported the NHLOA, such as college hockey, the minor leagues, and the juniors, and the overall media and fan support was on the side of the NHLOA, so the league was forced to draft a new CBA for the officials.